The Noble Fir is a superb tree. It has deep green foliage with an attractive blue hue. A majestic no needle drop tree with superb scent. It grows particularly well in Ireland and is regarded as the King of Christmas trees here. The Nordman Fir originated from the Caucus mountains in Russia. It has stunning foliage, beautiful shape and excellent needle retention. 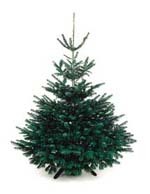 It’s soft bushy scented foliage make it an ideal tree to decorate and admire. 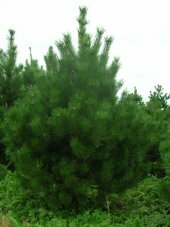 This conifer has orange-brown branches and green needles tufted towards the end of the branches. All pines shed the needles on the trunk annually so stamp the tree on the floor to clear any accumulation from previous years. This tree has good needle retention and a wonderful fragrance. 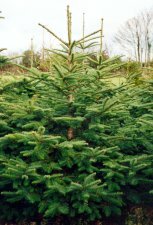 The Norway Spruce is the traditional Christmas tree as introduced to England by Prince Albert, in the early nineteenth century. Today Norway Spruce is still a very popular tree with strong scented needles and a bushy pyramidal shape. Freshly cut Norway Spruce will retain their needles for several weeks, but will suffer from increasing needle shed as time progresses.